What would you do with an extra $2,000? In my last article 5 Tips to Achieve Financial Success This Year, I recommended going through 3 to 6 months of your spending and looking for ways to cut back. If you’re having trouble with that step, then this article is for you! Here are three simple tips to cut your expenses and save an extra $2,000 in 2019. 1. Cut Out the Avocado Toast (Metaphorically Speaking). Saving money doesn’t have to mean radical change. Sometimes it just means scaling back on the things you already purchase. It’s good to treat yourself, but setting boundaries ahead of time will help you decide when to splurge and when to cut back. Keep track of all the times you ‘upgraded’, or spent money on impulse purchases, and compare it to your budget goal. If you are consistently going over that budget, then it’s time to make some changes! I know we’re talking about small numbers here, but think about it over the long term. What if instead of getting a Venti Latte every morning, you scaled back to a Tall? Or maybe you brought your own coffee to work a couple days a week instead of waiting in line at Starbucks? That one small change could mean over $400 per year back into your pocket! Have you ever signed up for something and totally forgot about it until a year later when the auto-renewal fee hit your bank account? No one? Just me? Oh, ok then. This is one of the sneakiest tactics that companies use to keep you as a customer. 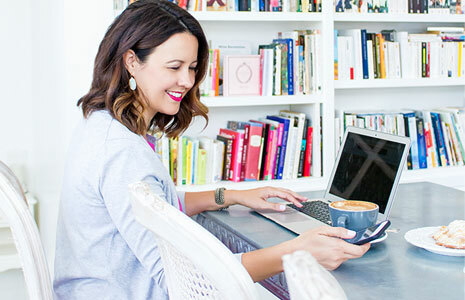 While it’s really convenient for essential bills like rent and utilities, it can be a budget killer when it comes to non-essential expenses like memberships and subscriptions. Make a list of all of your annual memberships and subscriptions, rank them from first to last based on how often you use them, and get rid of the bottom 3. Don’t keep something just because you might use it someday. I’m looking at you, gym membership card. Try to eliminate another $300 per year in annual subscriptions. I bet you won’t even notice they’re gone! When you’ve done everything humanly possible, use money saving robots. You can only cut back so much without sacrificing your lifestyle, and that’s where the money saving robots come in. Rebate apps are a great solution to shave a little extra off your everyday purchases. Ebates, Shopkick, and Ibotta all partner with retailers to offer you discounts and rewards if you shop through their sites. No more cutting coupons on the kitchen counter! Another great option is Honey. This browser plugin scours the web while you shop online, searching for digital coupons and promo codes. When you get to check out Honey will automatically apply the savings to your cart. But despite how easy it is, this tip is probably the hardest to see in action. Let’s be honest, none of these apps will save you big bucks; however, small steps like this can have the biggest impact. If you can manage an extra savings of just $5 per day using rebate and coupon apps—around $25 per week—over the course of a year, that comes out to $1,300 dollars! 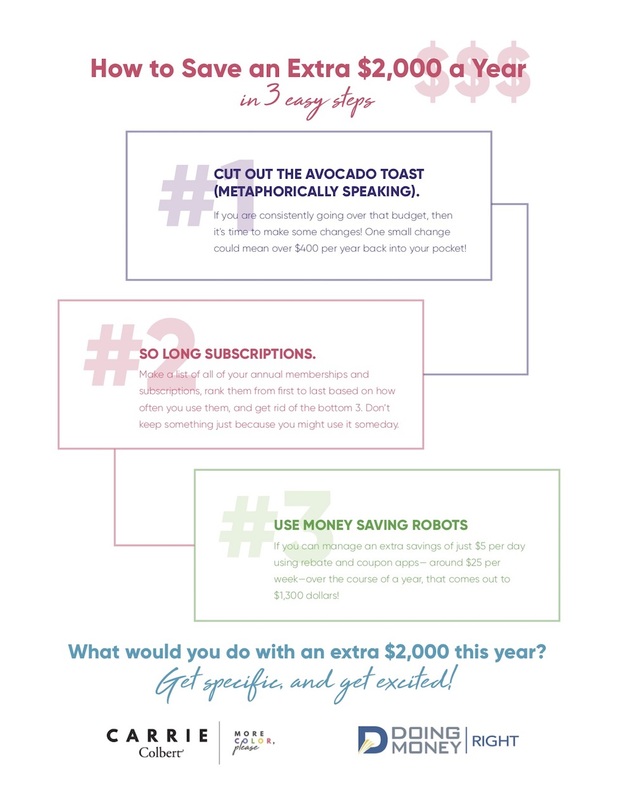 Seriously, what would you do with an extra $2,000 this year? I don’t ask this question lightly, because setting goals is one of the most—if not THE most—important step to a successful savings plan. Save money for the sake of saving money, and you’ll fail every time. Get specific, and get excited! The more excited you are, the more important your goal will become. And when it comes time to choose between that exciting goal and something less important, the choice will be clear. Find a free printable of the above graphic here! Sign up HERE to receive weekly tips and tricks on finance, education, home buying, insurance, Social Security and everything in between from Byron. This linen dress is bright and colorful and perfect for spring and summer. Did someone say Scrabble cookies?